In England it is traditional to make a simnel cake to celebrate Easter. 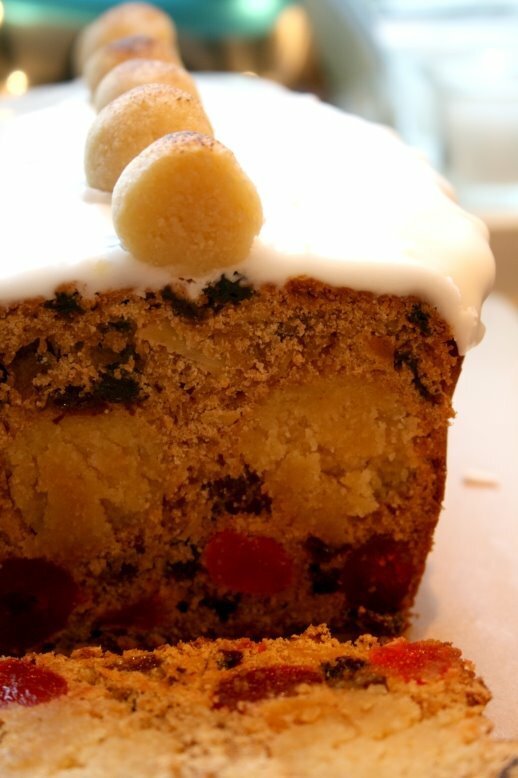 Similar to a Christmas cake in that it is a spiced fruit cake. It features 11 balls of marzipan which represent the 12 apostles excluding Judas. The cake is thought to have been around since Medieval times and the name comes from the Latin simila meaning fine wheat flour. Tradition dictates that it should be baked on Mothering Sunday by a daughter. If it is still moist when cut open on Easter Sunday it is a sign of a good cook (and potential wife!) As I only found this information out yesterday, and had missed Mothering Sunday I still decided to go ahead with it. The original recipe for this Simnel Loaf cake featured in this months GFM, I made some alterations due to ingredients I had available. I also made my own marzipan, which is far better than any shop bought version. It is meant to make 1 2lb loaf, but I was left with loads of extra cake batter so made some simnel cupcakes to go with the loaf. It turned out beautifully moist, I’m glad it did or I would have been proved to be a shocking wife and cook! Method wise it is very similar to a Boiled Fruit Cake. Rather than the important 11 marzipan balls being on the top of the cake they are distributed throughout the cake, a bit like a stollen. 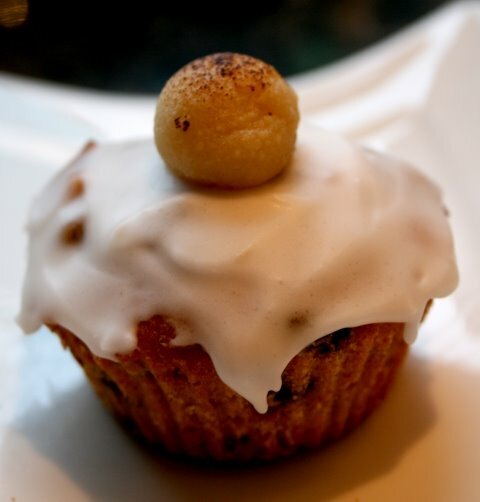 You can use this recipe to make just simnel cupcakes (I guess this recipe will make about 18), use the same amounts. The cooking times for the cupcakes are below. I’ve entered the cakes in to Julia’s Easter Cake Bake. It’s snowing here at the moment and we’ve been predicted heavy snow for tomorrow so we could be in for a white Easter. 1) Sift sugar into bowl then mix in almonds. 2) Add the lemon juice then the egg a tiny bit at a time. Beat to a firm paste then knead. It will end up having the texture of grainy dough. If it is too sticky add a bit more sugar and almonds. Wrap in clingfilm and chill in fridge while you prepare the rest of the cake. 1) Preheat oven to 150oc. Line 2lb with baking parchment. Ensure it goes high up the sides as the cake will rise. 2) In a large saucepan slowly heat butter, sugar, orange juice, dried fruits until boiling. Simmer for 10 minutes then allow to cool for 15 min. While this is cooling shape the cake marzipan into 11 balls around 2cm across. 3) Sift flour, spice and baking powder into the pan, then stir in eggs and almonds until everything is well combined. 4) Spoon cake mix into tin until it is about half full. Arrange the marzipan balls evenly over the cake mix then cover with the remaining cake mix (don’t over fill the tin). Smooth over the top. Bake loaf for 1 1/4 – 1 1/2 until a skewer will come out clean. Leave to cool in tin for 15 min, then remove and finish cooling on wire rack. Allow cake to cool fully before icing. If cooking cupcakes bake for 30 minutes at 150oc. 5) Lightly whisk egg white then beat in icing sugar until you have thick spreadable icing. Spread over the top of cake. Roll remaining marzipan into balls and brown with a blow torch (you could do this under the grill). When the icing is almost set press the marzipan balls along the top. It’s a great, tasty recipe. I make it every Easter. Loaf cake and 6 cupcakes currently in the oven! Thank you for the recipe.